Axor Hotels and Suites is a luxurious 3-Star hotel located at Plot 16/17 Sule Olusesi Street, beside Conservation Center, Opposite Chevron Quarters, 2nd Toll Gate, off Lekki-Epe Expressway, Lagos. It is an exclusive boutique hotel that offers timeless elegance and an unrivalled location in the serene part of Lekki. Its strategic location gives easy access to places like Elegushi Beach, Lekki Market, Banks, Shopping Malls, Cinemas and Clubs. Axor Hotels and Suites has a total of 20 air-conditioned rooms which feature an en-suite bathroom with walk-in showers. 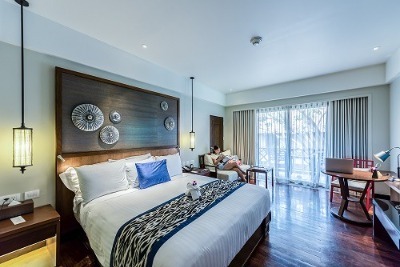 Room categories include the Standard Room, Deluxe Room and Executive Room. Some room categories offer a whirlpool bath. Each room is painted in earth-toned colour and features a flat-screen TV, exotic bedding, a flat-screen TV with satellite reception, and a refrigerator. A number of facilities are available at Axor Hotels and Suites. They include: Free Wi-Fi, a restaurant and bar. Complimentary breakfast is served daily. Axor Hotels and Suite's restaurant serves continental and local dishes, while guests can order a variety of alcoholic and non-alcoholic drinks from the well-stocked bar. Guests can a take a dip in the swimming pool onsite. The hotel offers additional services on requests: Laundry/dry cleaning services; airport shuttle services are available for a fee; the premises are guarded by security personnel, CCTV camera security; and parking spaces are provided at no extra cost. It has a standby Mobility shuttle (air-conditioned) to pick up and drop off guests in any part of Lagos without any cost; complimentary newspaper and complimentary car are afforded to guests. Q: Does Axor Hotels And Suites suites offer free Wi-Fi? A: Axor Hotels and Suites offers free Wi-Fi to all checked in guests. Q: Does Axor Hotels And Suites have a swimming pool? A: Yes, there is a swimming pool in this hotel. Q: Does Axor Hotels And Suites offer complimentary breakfast? Q: Is there a fitness centre/gym at Axor Hotels And Suites? A: Yes, a modern gym is available at the hotel. Q: Does Axor Hotels And Suites have a restaurant? A: Yes, it has a restaurant. Axor Hotels and Suites is a budget hotel in Lekki, Lagos. My stay at the hotel was nice but it can be better. Complimentary breakfast was not given and it ought to be given because I paid for it. The room was quite manageable but there was no water running in the bathroom. The services should be worked on. Amazing place. Amazing service. Nice bar and sound system. Amazing rooms. I enjoyed my stay at the hotel especially the complementary breakfast given. You cook well, keep it up. Also, I like that the rooms are kept clean and the management has ensured that the guests are kept comfortable. I am satisfied with the quality of service delivered here and I would gladly use this place again when the occasion arises. The team is very friendly, service is good, food is great and location is perfect because it is right in the middle of Lekki . The rooms are clean though bedding needs to be improved, some of the sheets are worn out. The manager is also fantastic. My stay was fine. The hotel's surrounding was very neat and my room was very tidy and well decorated, with very clean bed sheets, a clean curtain, a functioning AC, and a mini TV. Every necessary toiletry was also provide. I also enjoyed the meal at the hotel and also the laundry service was really affordable. It was a pleasant stay at Axor Hotels And Suites. Have nice pictures of Axor Hotels and Suites?